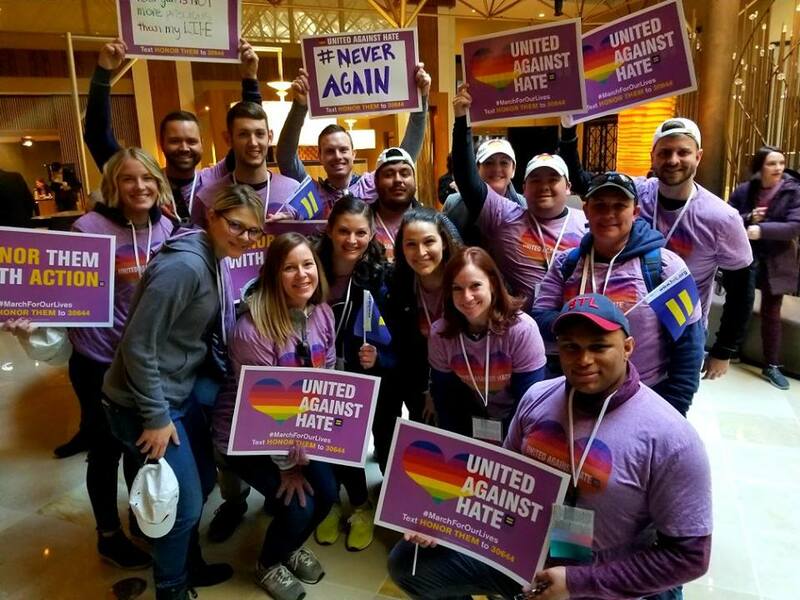 On Saturday 24th March, in Washington DC, Pulse Nightclub shooting survivors and family members led hundreds of members and supporters of the Human Rights Campaign (HRC) — the LGBTQ civil rights organization — in the March For Our Lives. Before stepping off, the survivors and family members addressed HRC’s annual Spring Equality Convention to talk about the Pulse Nightclub shooting and the importance of mobilizing the LGBTQ community against gun violence. (Watch their remarks here). Christine Leinonen, mother of Drew Leinonen; Brandon Wolf, friend of Drew and Drew’s boyfriend, Juan Guerrero, who were both killed; and José Arraigada — the three of which appeared and spoke on stage at the DNC, one month after the shooting in 2016 — joined with fellow survivor and Pulse survivor, Ricardo Negron, onePulse Foundation Board Chair, Earl Crittenden, and HRC President, Chad Griffin, to lead hundreds of HRC members and supporters. 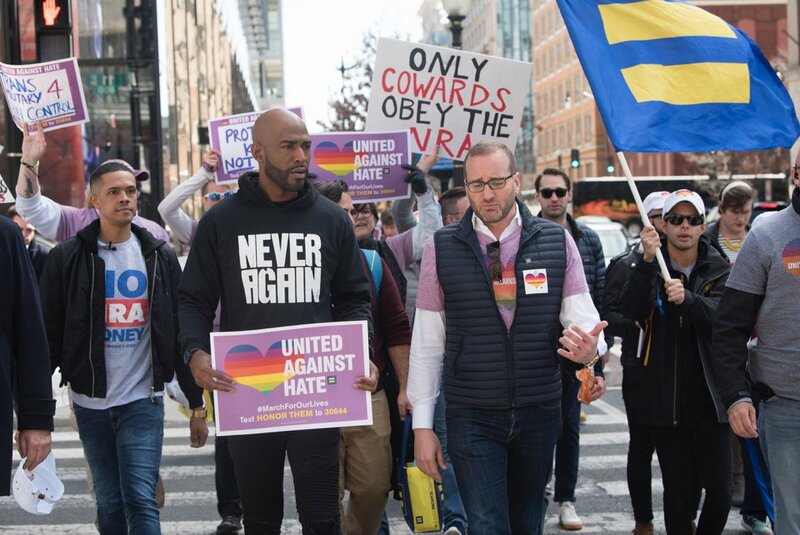 The marchers were also led by Karamo Brown, one of the hosts of Queer Eye and a graduate of Marjory Stoneman Douglas High School in Parkland, Florida. Brown knew Aaron Feis, the football coach who was killed in the Parkland attack. He is the co-founder of 6in10.org, which combats HIV stigma, and provides support and education to the Black LGBTQ community. Brown has partnered with the Los Angeles LGBT Center, the Center for Disease Control, and the National Black Justice Coalition through his advocacy. “Today we’re proud to be led by Pulse survivors and family members and join the hundreds of thousands of students and their supporters from across the nation in the March For Our Lives,” said HRC President Chad Griffin. In 2016, after a gunman killed 49 people — most of them LGBTQ and Latinx — in Orlando’s Pulse Nightclub, HRC’s Board of Directors adopted a resolution that addresses both the epidemic of hate that has fueled anti-LGBTQ-motivated murder, assault, and discrimination, as well as common-sense gun violence prevention policies that would help keep the LGBTQ community safe. Since 2013, HRC has tracked 111 incidents of fatal violence against transgender and non-binary people. Of these, 62 have been victims of gun violence. In 2017, 16 out of the 28 deaths were the result of gun violence. The Human Rights Campaign is America’s largest civil rights organization working to achieve equality for lesbian, gay, bisexual, transgender, and queer people. ← Sarah Sylvia Due To Release LGBT-themed Debut Single ‘St Vincent’ March 30th!